In 2017, the extensive flooding in Houston caused by Hurrican Harvey cost $125 billion in damage. More than 40% of the business that was flooded will never recover and close their business and dreams. As the sea-level rises with climate change, flooding is a major risk for businesses. If you own a business, a flood can damage your infrastructure, your inventory, and your ability to operate in an instant. Protecting yourself with commercial flood insurance helps mitigate that risk and recover your costs. Many private flood Insurance policies now have coverage for loss of Business Income and Extra Expenses that come with the clean up after a flood. What else is involved in commercial flood insurance do you need it even if you’re not at a high-risk for flooding? The short answer is yes. The long answer is our 5-step guide below. Why Do You Need Commercial Flood Insurance? Your standard insurance won’t cover you in the case of a flood. Whether you have a Commercial Package Policy or Business Owners Policy, you’re only covered for water that comes from above. That is water damage to your inventory from a roof, for example. Water that comes from a creek, river, storm surge or flash-flood and damages your building and inventory isn’t covered. For that, you need commercial flood insurance. It’s separate insurance that protects both your building and your inventory. Commercial flood insurance policies protect your business when flooding affects floors, ceilings, walls, equipment, fixtures, furniture, inventory, and business property. This includes water damage sustained from storm drains, rivers and creeks, as well as storms. If the flood was a natural disaster, you’re still covered. Without flood insurance, you’ll be covering flood damages from your own pocket. The other option is to take a low-interest disaster relief loan from the federal government. These have to be paid back in full and ultimately come out of your pocket, too, plus they will require you to jump through a bunch of government red tape. And will require you to have a flood insurance policy before you get this loan. The average commercial flood insurance claim is north of $97,000. I don’t know of a small business that has that kind of cash sitting around most of us are reinvesting every dollar back into the business. 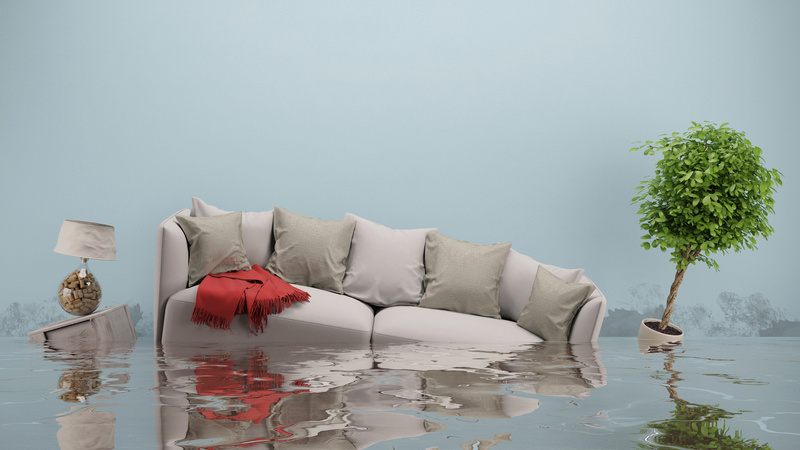 If you’re unable to cover the costs of flood damage, which might be one of the most extensive damage that’s very expensive, then you may be forced to cease business. Close up shop, go back to working for someone else. Do You Have to Have Commercial Flood Insurance? Some businesses are required to have flood insurance by their mortgage lenders. If your business is located in a high-risk area flood zone map, (A or V) you’re required by law to have flood insurance. And your lender will be forced to make you purchase commercial flood insurance before you close your loan. Flood insurance rate maps change. Even if you weren’t part of a high-risk area at the time of purchasing the property, you may be part of it now. To determine the risk level for flooding in your geographic location, you can check the FEMA Flood Insurance Rate Maps. Even if you’re not located in a high-risk area, other factors can put you at risk for extensive flood damage. Development, parking lots, roadways all change the way water may flow in a massive rainstorm. If you’re located in an area that experienced snow-filled winters and warm springs, melting snow can cause flooding by forming dams that cause water to be diverted. If you don’t live in a dry climate and you experience rainfall in your area, you could be at risk of flash-flooding or a storm-surge that causes sewer backups. The term “King Tide” is becoming a reality for those who live on the coast. What’s Involved in a Commercial Flood Insurance Policy? Unless you are closing on a loan, an NFIP commercial flood insurance policy won’t take effect until 30 days after purchase. Some private flood insurance policies can be as little as 10 days, however, if you are closing on a loan we can make the policy active on the closing day. Be warned though you can’t purchase it when a storm is on the way and expect that your damages will be covered. Traditionally, flood insurance could only be purchased through the National Flood Insurance Program (NFIP). This is managed through the Federal Emergency Management Agency (FEMA). The federal government administers flood insurance but it’s sold through specialized insurance providers. They offer two policy’s for commercial businesses. A standard policy is can be bought by businesses in high or undetermined flood zone risk Maps. Insurance can be purchased to provide coverage to the building for up to $500,000. The contents of the building are insured for up to $500,000 as well. These policies are separate policies with separate deductibles. A Prefered Risk Policy is for businesses falling with flood zones Maps B, C or X on the FEMA flood insurance rate map. The building and content insurance are provided in one policy, with one deductible. The preferred Risk Policy has the lowest premiums you can get through the NFIP. Many Private flood Insurance policies also offer commercial flood insurance and can be broader coverage and premiums are much better we are taking like hundreds, even thousands of dollars better. Click here to see your options. Some are saving up to $5,000 dollars a year on premiums. What is an RCBAP flood policy? A hand full of Private flood insurance policies also offer master flood insurance coverage and can be broader coverage and premiums are much better we are taking like thousands of dollars better. We helped one community save $50,000 over the NFIP policy. Click here to see your options. What Isn’t Covered Through the NFIP? What isn’t covered by the NFIP is covered by you. You should be aware of the limitations to the government policies. Equipment and business property outside of the building isn’t covered. This includes septic systems and cisterns. If a sinkhole or mudflow should develop, you’re not covered by any damaged caused by them. This is the case even if they developed as a direct result of the flood. Your business vehicles aren’t covered. You can get your vehicles covered for flooding under your vehicle insurance as an endorsement. Any damage to your building over $500,000 is not covered. For this, you will need to buy an excess coverage. Any damage to your inventory or business property (desks, computers, paper) over $500,000 is not covered. Actual Replacement Value is not guaranteed by the NFIP. You can’t recover any financial damages resulting from having to shut down your business to recover from flood damage. The costs of business interruption have to be absorbed by you. This is not the case on some private flood insurance policies. Are There Options Outside of the NFIP? Private flood insurance offered through Lloyds of London flood policy can be purchased as primary or excess to your NFIP policy. The benefits of commercial flood insurance provided by one of these companies are that you can purchase insurance higher than the NFIP limit of the $500,000. You also have the option to cover financial losses that result from business interruption. Do You Have Commercial Flood Insurance? If you already have commercial flood insurance through the NFIP, you now know that you can increase the amount you’re covered for or ask a flood nerd to shop the policy on the private flood insurance. A private insurance company can provide you with coverage in excess of the $500,000 limits on building and contents. They can also cover your financial losses. If you’re a business owner without commercial flood insurance, you’re putting your business at risk. Contact us today for a quote on commercial flood insurance.